The Hampton Club Spectator Bench is a convenient, comfortable seating solution for any room in your home. Handcrafted from solid hardwood with a beautiful Walnut furniture finish, the Hampton features mortise and tenon joinery for superior strength. The soft padded seat cushion, upholstered in a durable black synthetic leather material, adds the final touches to this extra comfortable spacious seating solution. Includes a full base support system for added strength with foot rest. Some assembly required. 180-Day Limited Warranty. Keep your mud room or entryway neat and tidy with this beautiful and unique hall tree with storage bench. Spacious seating area flips up to reveal a large storage section. The bench features a split seat, allowing the user to rest on one side of the bench, while retrieving articles from the storage compartment on the opposite side. A back panel with four hooks is perfect for hats and coats. Rich "walnut" finish will compliment virtually any decor. This hall tree will provide function and style to any room. 250 pound weight limit. Industrial metal meets fashionable functionality with this gorgeous charcoal grey steel tube metal 60" high entry bench. Whether you are coming or going, this uniquely designed bench features 4 double coat hooks, a large storage shelf and a black 3.5" thick padded leather-look seat for added comfort. 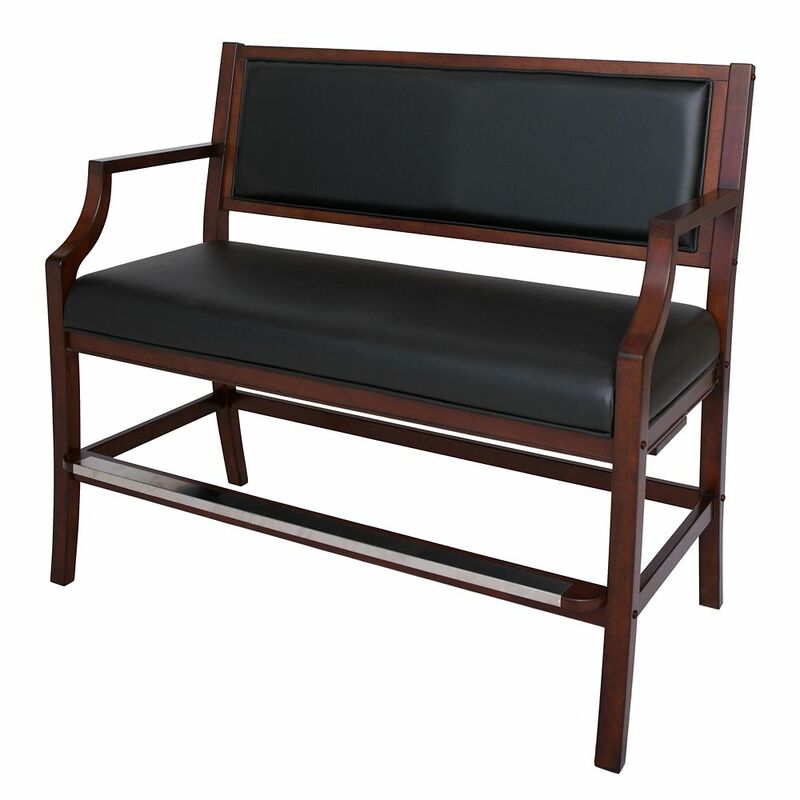 The Lawton Entryway Bench is a comfortable and attractive entryway piece. The bench features a large cushioned seat that is upholstered in a durable, easy care fabric. As well the Lawton Entryway Bench features a lower slotted storage shelf, perfect for storing shoes, boots, umbrellas and more. Assembly is required. Hampton Club Spectator Bench - Walnut Finish The Hampton Club Spectator Bench is a convenient, comfortable seating solution for any room in your home. Handcrafted from solid hardwood with a beautiful Walnut furniture finish, the Hampton features mortise and tenon joinery for superior strength. The soft padded seat cushion, upholstered in a durable black synthetic leather material, adds the final touches to this extra comfortable spacious seating solution. Includes a full base support system for added strength with foot rest. Some assembly required. 180-Day Limited Warranty. Hampton Club Spectator Bench - Walnut Finish is rated 1.0 out of 5 by 1. Rated 1 out of 5 by Jlo from Material used was not good quality. Parts were not all functional or included. Leather bench ha... Material used was not good quality. Parts were not all functional or included. Leather bench had styrofoam smashed into it.